Mulberry Cottage and Charlton House: Situated on the tranquil Grootplaats Farm just outside of Murraysburg, you will find Charlton House and Mulberry Cottage which are two wonderful self-catering cottages. We are privileged to share the beauty and tranquility that is Grootplaats Farm. 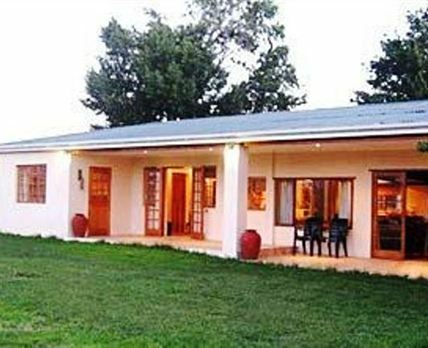 Mulberry Cottage is a private, fully furnished, north-facing unit nestled beside the Buffels River. There are two bedrooms. The first bedroom features twin beds and the other offers twin beds and a bunk bed. The rooms share a full bathroom. A gas geyser supplies hot water. Bath towels are supplied for guests, however they are to bring their own swimming towels. The kitchen offers a gas stove, a microwave, a fridge, a kettle and a toaster. We have kept the paraffin lamps for those who enjoy the ambiance of low light. The lounge has a fireplace and there is a large patio with a braai area, as well as a fireplace in an old soap pot, perfect for those cold winter nights. Wood is supplied. Meals can be supplied by prior arrangement. Charlton House is situated next to the main homestead, but it has its own entrance and outside entertainment, as well as a braai area. The house consists of an open-plan kitchen, dining and bar area. It features a fireplace to help warm you up during winter. There are three bedrooms. The main bedroom has a double bed and a single bed, a small TV, a walk-in cupboard and an en-suite bathroom with a shower. The other two bedrooms share an interleading full bathroom. They consist of twin beds and a double bed respectively. The lounge has a TV with DStv available. There is also underfloor heating in the lounge. The veranda is north facing and has a braai area on the one end. Wood is supplied. For the warmer summer months the one end of the patio has fine mist sprayers which cool the air. The pool is at the main homestead and guests are welcome to use it as they would like; some even swim in the river. A beautiful waterfall is just upstream from the cottage and guests can go for walks, cycle with their own bikes and explore the farm. Click here to enquire at Mulberry Cottage and Charlton House.